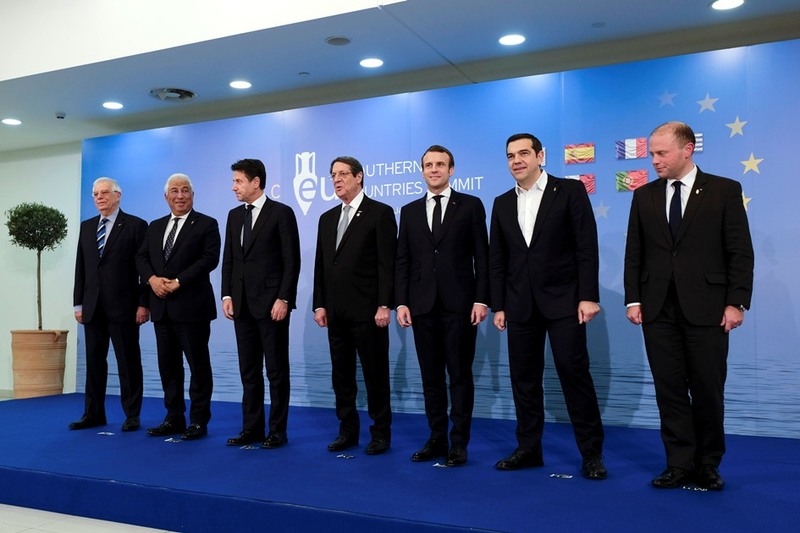 We, the Heads of State or Government of Cyprus, France, Italy, Greece, Portugal, Malta, and Spain, have convened in Nicosia for the fifth Summit of the Southern European Union Countries. Following our last Summit in Rome, we gathered today to reaffirm our profound commitment to the European project and our common values, such as the rule of law, freedom, democracy, human rights and solidarity and to address multiple challenges through continuous display of solidarity and collective responses at the EU level. We reaffirm our strong belief that, building our common European project upon a perspective for the Mediterranean as a region of peace, stability and prosperity, is in the interest of Europe as a whole. Convinced that a strong and united European Union is the best way forward, we are determined to contribute constructively to the debate on our shared future. At the Sibiu Informal Summit, on 9 May 2019, we intend to provide guidance for the new legislative cycle and contribute to the Strategic Agenda for 2019-2024. We also anticipate a renewed commitment to a modernised EU that delivers on the issues that really matter to its citizens. We have paid close attention to the results of our intensive cycle of Citizens’ Dialogues and Citizens’ Consultations; in our work on the next Strategic Agenda, we will make our utmost in providing new and appropriate ways of engaging citizens and responding to their legitimate concerns. The decision of the United Kingdom to leave the EU remains regrettable, but one we respect. We remain committed to an orderly withdrawal of the United Kingdom from the EU in order to guarantee certainty for citizens and businesses and the basis for an ambitious future partnership, in accordance to the EU’s own principles and internal order. We stand firmly by the Withdrawal Agreement and we intend to proceed with its ratification. We will also intensify our work on preparedness for the consequences of the United Kingdom’s withdrawal, taking into account all possible outcomes. We reiterate our steadfast support to the ongoing efforts by the United Nations Good Offices Mission for the resumption of meaningful negotiations leading to a comprehensive and viable solution to the Cyprus problem in accordance with relevant UNSC resolutions and in line with the EU acquis, values and principles. We commend the efforts of the Government of the Republic of Cyprus to reach a solution, which reunifies Cyprus and its people, safeguards Cyprus’ sovereignty, independence and territorial integrity, free of foreign interventions, troops and guarantees. The Republic of Cyprus is and will remain a member of the European Union following reunification, and EU membership is the best safeguard for a reunited Cyprus. It is of utmost importance that the EU remains actively involved in the negotiations upon resumption, in order to ensure that a reunited Cyprus remains a fully functional member of the Union, compliant with EU acquis. Whilst being on the path to economic growth, our Union still faces complex economic and financial challenges, which require careful and result-oriented measures. Our aim is to build a European economy that serves everyone, based on convergence between its Members States and combining economic growth and social well-being, in full respect of the principles of the European Pillar of Social Rights, including a stand-alone EU Gender Equality Strategy. Further decisive steps are needed for deepening the Single Market, especially in the areas of digital and energy and ensuring it provides a solid underpinning for an outward-looking, confident and more autonomous EU in a challenging global environment. We recognise the importance of trade for growth and job creation through an ambitious and balanced free but also fair trade agenda within a rules-based multilateral system. We will work for an evolved Single Market that fully embraces the digital transformation, including Artificial Intelligence, Distributed Ledger Technology and the December 2018 Southern European Union Ministerial Declaration, the rise of the data and service economy, connectivity, and the transition to a greener and circular economy. We firmly support the launch of the European Innovation Council pilot, which should become a leading global actor in the area of breakthrough innovation. We expect the Spring European Council to provide ambitious guidance on such a future development of the Single Market and European digital policy. We will also continue our close cooperation with the aim of adopting as many legislative proposals as possible that have a direct impact on citizens’ daily lives ahead of the European Parliament elections, including the copyright reform. We support the swift establishment of a European Labour Agency enhancing EU rules on fair labour mobility and ensuring their fair and effective enforcement. In this regard, we note Cyprus’ readiness to host the seat of the Agency in Nicosia. At the same time, we remain committed to further deepening the Economic and Monetary Union (EMU), building on the outcome of the Euro Summit of 14 December 2018, and also bolstering the international role of the euro. We look forward to the swift completion of the Banking Union and the Capital Markets Union, including continuing the work on a roadmap for political negotiations on establishing a full-fledged European Deposit Insurance Scheme, with a view to strengthening financial stability and the resilience to economic shocks. Advancing on the design and gradual implementation of a budgetary instrument for convergence and competitiveness for the Euro area remains a top priority. We stand ready to pursue the discussion within the Eurozone towards a stabilization function in the Euro area as well. A modern EU requires an adjusted and flexible budget for 2021-2027 and with sufficient means. We welcome the European Commission’s proposals on the new Multiannual Financial Framework (MFF). We are committed in doing our utmost aiming at concluding negotiations by autumn 2019, and we stand ready to assist the Romanian Presidency of the Council in its efforts. We attach particular importance to policies with clear deliverables that promote growth and competitiveness, and enhance convergence and solidarity between Member States. Whilst agreeing on the need to address both new and pressing challenges, we equally believe in sustaining the essential role of the two main investment policies, the Common Agricultural Policy and Cohesion Policy, with proven added value and contribution to the Union’s development. Both policies should be adequately financed. All rebates must be removed as from 2021. We acknowledge the severe consequences and direct threat that Climate Change poses to the world and to the Southern regions of Europe and the Mediterranean basin in particular. It is one of our citizens’ main preoccupations to which we shall swiftly respond by shifting to a low carbon model of economy, thus confirming our leading role in setting the international Climate Change agenda. We welcome the outcome of COP24 in Katowice, including the communication or updating of the EU National Determined Contribution by 2020, taking into account the collective further efforts needed and actions undertaken by all Parties to meet the objectives of the Paris Agreement. We anticipate the swift adoption of a result – oriented and ambitious EU Strategic long-term vision for a carbon neutral – economy by 2050. Cyprus stands ready to assume a regional role to tackle climate change by promoting coordination and cooperation between the countries of the region so that a targeted Action Plan is developed. The goal of energy security remains of paramount importance and we will work towards enhancing energy efficiency and the promotion of Renewable Energy Sources. We welcome the election of Dr. Francesco La Camera to the post of the Director General of the International Renewable Energy Agency, as an important success for EU policies on the matter. We remain committed towards completing our Energy Union, in particular a fully integrated and interconnected European energy market. We recognize that the Western and Eastern Mediterranean region is a strategic corridor for gas supplies and electricity through gas infrastructures such as the EastMed pipeline, thus contributing to the Union’s policy for diversification of sources, suppliers and routes, as part of the Union strategic energy security policy that also demands better interconnections among its Member States and in the Western Mediterranean and Atlantic regions. We recall the EU’s energy security strategy, especially in the Eastern Mediterranean and we reiterate our commitment to ensure the continued involvement of European companies in the area. We express our full support and solidarity with the Republic of Cyprus in exercising its sovereign rights to explore, exploit and develop its natural resources within its EEZ, in accordance with EU and international law, including the 1982 United Nations Convention on the Law of the Sea. We recall previous Council Conclusions, and call on Turkey to respect the sovereignty of Cyprus and to refrain from threats or actions that are contrary to international law. On this basis, a responsible and rules-based EU-Turkey energy dialogue could be mutually beneficial. We reaffirm the importance of the EU relations with Turkey and reiterate our commitment to maintaining an open dialogue, to addressing common challenges and to cooperating in essential areas of joint interest such as migration, counter terrorism, transport, economy and trade. We are, however, especially concerned with the situation in the country. Recalling previous Council Conclusions, we reiterate that Turkey must fulfil all its pending obligations under the Negotiating Framework including its obligation to respect International Law and good neighbourly relations in the Aegean and the Eastern Mediterranean. It is also recalled that recognition of all EU Member States is a necessary component, calling Turkey to normalize its relations with the Republic of Cyprus. The full, non-discriminatory implementation of the Additional Protocol to the Association Agreement and the lifting of the restrictions in its ports and airports/airspace towards Cyprus and EU companies related to Cyprus, will also be beneficial for the whole region. While recalling the Thessaloniki Agenda, we welcome the ratification of the Prespes Agreement and look forward to its implementation, as it will benefit our broader region. The management of migratory flows continues to pose one of the most serious challenges that our Union is faced with and requires long term solutions combining more effective control of the EU’s external borders, increased external action, and strengthened internal cooperation. We, the Southern European Union Countries, at the forefront of migratory external pressures strongly believe that shared responsibility and solidarity with those most affected must underpin the EU’s common Migration Policy. Full implementation of the Conclusions of the June 28 European Council remains urgent. Effective reform of the Common European Asylum System, through the swift adoption of the entire comprehensive package of interconnected legislative proposals, should guarantee solidarity and responsibility among the Member States. In addition, the disembarkation of rescued migrants in the Mediterranean should be addressed through permanent solutions, based on the principles of solidarity, responsibility and in the framework of international law, ensuring their order to safeguarding of lives in the Mediterranean. We take into account the pressure on those Member States that are most exposed and already contribute to the rescue of people in danger. Progress has already been achieved, as reflected by the decrease of detected illegal border crossings but migratory routes, such as those running through the Eastern, Central and Western Mediterranean, continue to require close attention. In this regard, the sustained and non-discriminatory implementation of the EU-Turkey Joint Statement of 18 March 2016 and the full and effective implementation of the EU-Turkey readmission agreement and cooperation with all EU Member States in Justice and Home Affairs matters remains essential. Continued vigilance on the Central Mediterranean route, in line with the June 28 European Council Conclusions, is also called. In the Western route, where as well challenges remain, cooperation with Morocco is essential. We remain committed in addressing the root causes of irregular migration by using all tools available at the EU level as well. In this context, we must intensify work with all our partners outside the EU, by further promoting a comprehensive partnership with Africa on economic development and managed migration and implementing the Joint Valetta Action Plan, as updated in November 2018; by replenishing the EU Emergency Trust Fund for Africa; by stepping up cooperation with Asian countries; by effectively putting an end to human trafficking networks; by further supporting in coordination with UNHCR and IOM, Middle Eastern countries that bear the responsibility of hosting large numbers of refugees, on a prolonged basis. Additional sanctions against traffickers should be also considered at the EU and UN level. We remain committed to contributing to a Union that can provide a better crisis and emergency support to its citizens. We will continue working towards the swift implementation of a Union Civil Protection Mechanism (RescEU) that will provide Member States with the means of dealing with disasters, including natural, and other severe emergencies. We continue witnessing new challenges to European security, amongst them the heinous terrorist attacks in the heart of our cities, as we saw again recently in Strasbourg. We stand in full solidarity with all those affected by the scourge of terrorism, paying our deep respect to all its victims, in Europe and beyond. We will spare no effort in bringing such acts of violence to an end. Our citizens’ security remains our top priority and our resolve in completing the Security Union is unwavering. We shall continue reinforcing our mutual judicial and police cooperation and conclude, before the end of the present legislature, current legislative proposals, notably the proposal on the dissemination of terrorist contents online and on e-evidence. Rising cyber threats and disinformation must also be addressed. The Union must become a credible security provider for its citizens, in line with the level of ambition of the EU Global Strategy, enhancing its strategic autonomy and its capacity to act. We welcome the substantive progress made in the area of security and defence, including in implementing Permanent Structured Cooperation (PESCO) and in the negotiations for the establishment of a European Defence Fund and we stress the importance of keeping the momentum. European action shall be aimed at addressing regional and global challenges with a special focus on the Mediterranean, EU’s southern neighbourhood, and Africa. The Sahel Region continues demanding particular attention. Democratic, stable and prosperous partners is a strategic priority and in the interests of the EU. We attach particular importance to the strengthening of relations and cooperation between the EU and the Arab world and we look forward to the upcoming EU-League of Arab States Summit, in February 2019. The Summit gives an excellent and timely opportunity to coordinate our efforts to jointly address regional challenges and threats, and meaningfully enhance relations in various fields, notably security, migration, fighting terrorism, sustainable development, climate change. We commend regional initiatives, developed through trilateral cooperation schemes in the eastern Mediterranean region and acknowledge their important role towards achieving a more focused and extended regional cooperation in addressing the challenges of the region. We support the further deepening and possible enlargement of these trilateral cooperation mechanisms, as they constitute an important tool, which reinforces our collective efforts to promote peace, security, stability and prosperity.